This article intended for those migrating from Windows and Microsoft Office. 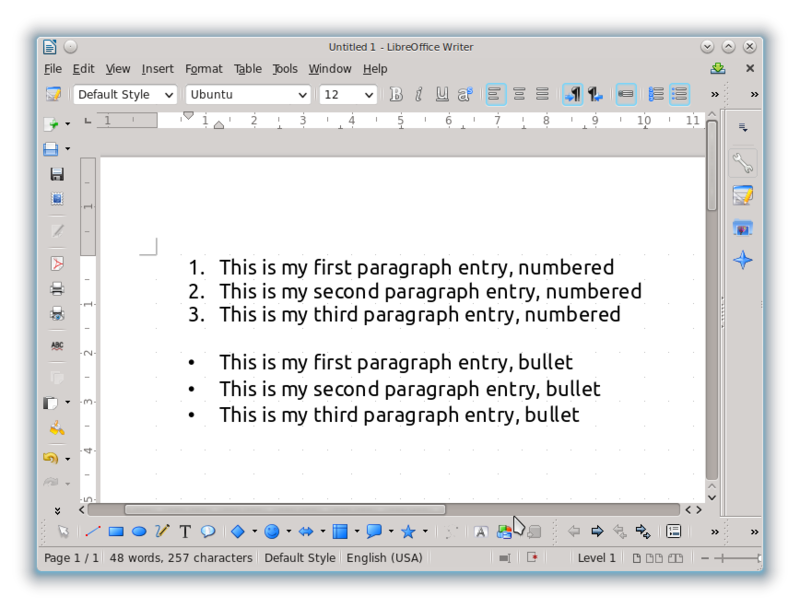 This is a basic article about how to use basic LibreOffice Writer features to format text. You will find bold, italic, underline, bullets and numbering, text color, spacing, and finally text upper and lowercase. 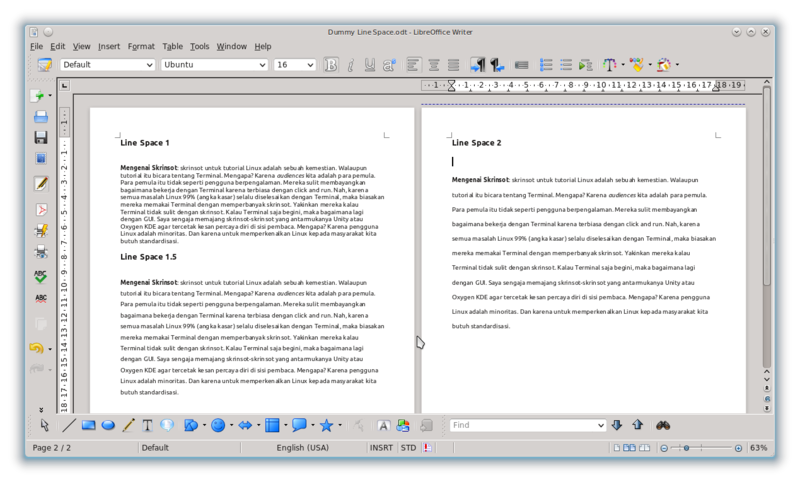 It is similar with same word processor such as Microsoft Word, Abiword, Calligra Words, and so on. Select the text and do click at icon or do tap shortcut key. In Writer, you can just put your cursor at the word and tap shortcut key to change the format. To make it, you can choose whether creating numbering entry first or creating the text first. Here my example for the second. Type 2 paragraph of text > select them > click numbering button. If you want them to be bullets, then click bullet button. To remove numbering or bullets, select all text then click again the Numbering On/Off button or Bullets On/Off button. 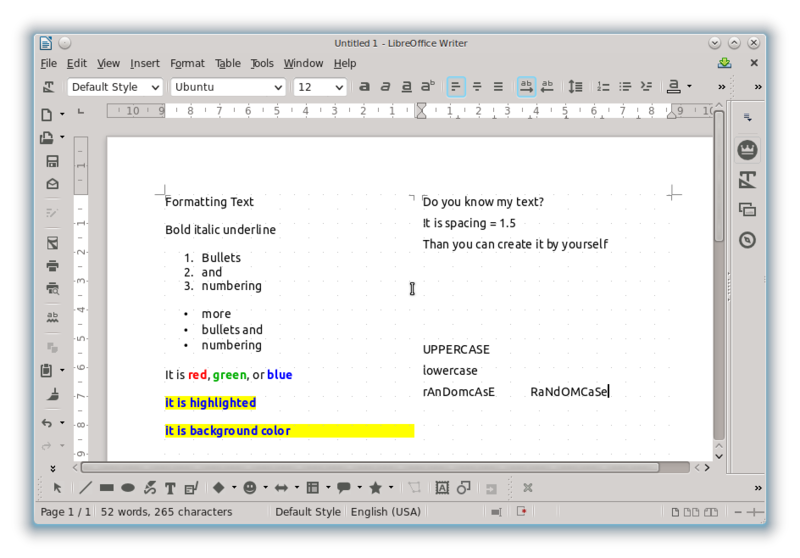 To color a text, select the text > select icon Font Color > select a Color. Your text will be colored. To highlight a text, select text > select icon Highlighting > select color. Your text will be highlighted. This is useful for certain document you learn e.g. biology lecture. To give text a background color, select text or just put your cursor at the text line > select icon Background Color > select color. 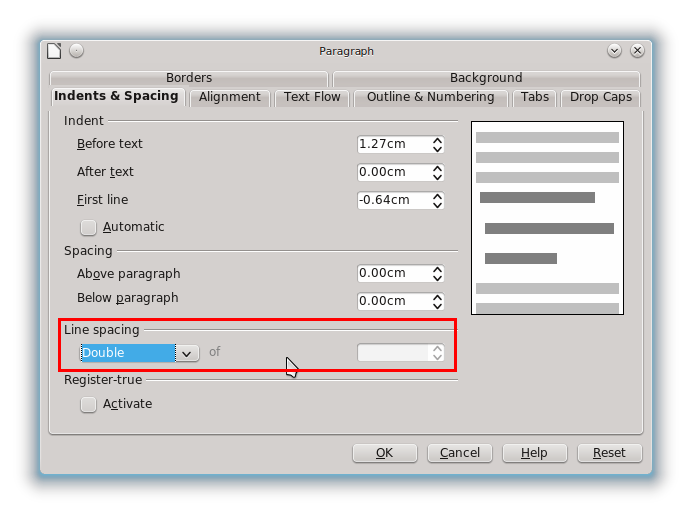 Your text will have background color as long as the line width. This is useful for some text you need to explain it differently e.g. Linux commands. 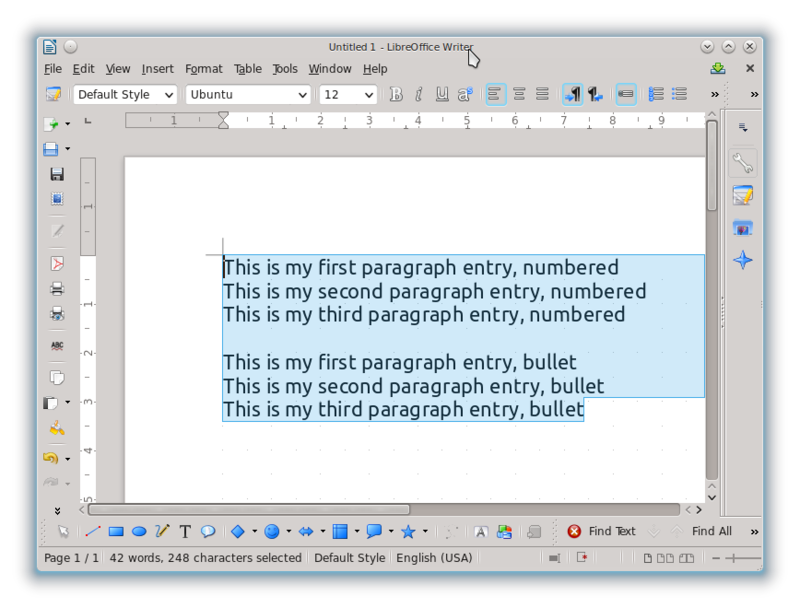 In LibreOffice Writer, you can change the text case instantly. You can use menu Format > Change Case > select one case type. See picture below. 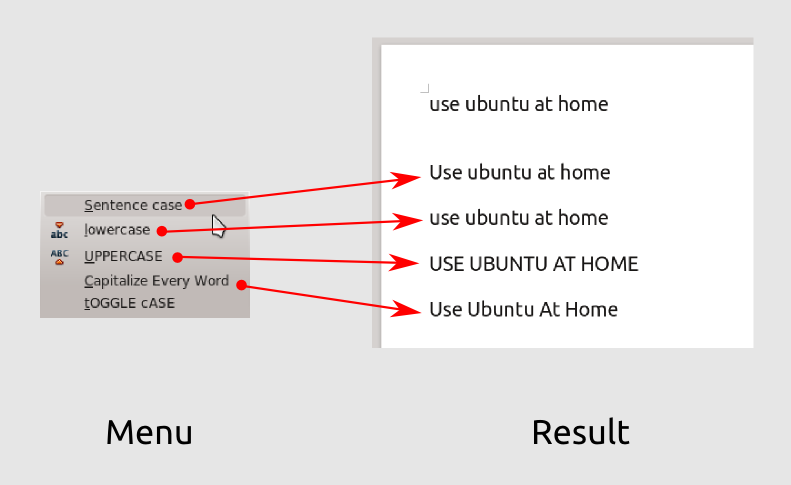 Use ubuntu at home: if you choose Sentence case. It is case type similar to a sentence, which is uppercased at first letter and lowercase for remaining text until end of sentence. use ubuntu at home: if you choose lower case. It is useful when you want all text to be lowercased. USE UBUNTU AT HOME: if you choose UPPERCASE. It is useful when you want all text to be uppercased. Use Ubuntu At Home: if you choose Capitalize Every Word. It is useful for title text or anytime you want every first letter in every word to be capitalized. If you choose tOGGLE cASE, any case will be reversed to its opposite. So if you have bEcOmE then it will be BeCoMe and vice versa.